Our garden lighting will transform your property like nothing else can. Your prized landscaping shouldn’t disappear when the sun goes down. Let our design team help you immerse your gardens in a soft glow so you can continue to enjoy the natural beauty as late as you want. The right garden lighting can subtly emphasize your foliage, ensuring your landscaping does not go unnoticed. Whether you’re entertaining on the patio or gazing at your backyard from inside, properties in London, Guelph, Simcoe and anywhere between look better with our custom backyard lighting designs. When you in the scenery surrounding your home, you should be able to enjoy it whenever you want. Instead of losing the texture and life in your property at sundown, you can watch as your landscape transforms with new light, creating shadows, depth and drawing attention to the characteristics that express your personality and make it unique. Our objective is to infuse your property with a radiance that will enhance your enjoyment of your outdoor living space. Depending on your current and desired use of your property, you work with us to create a customized system that will enrich your gardens and give you a new appreciation for entertaining and relaxing in the open air. Using high quality fixtures that are fully programmed and automated, your low maintenance system will give your land a luxurious and elegant appearance. Your outdoor space will become an extension of your interior, as the hidden fixtures create the ambiance that you envisioned. 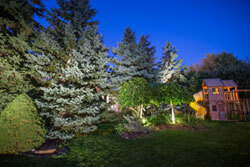 Request a consultation today to bring your landscape to life with garden lighting in London, Guelph, Stratford or Simcoe.